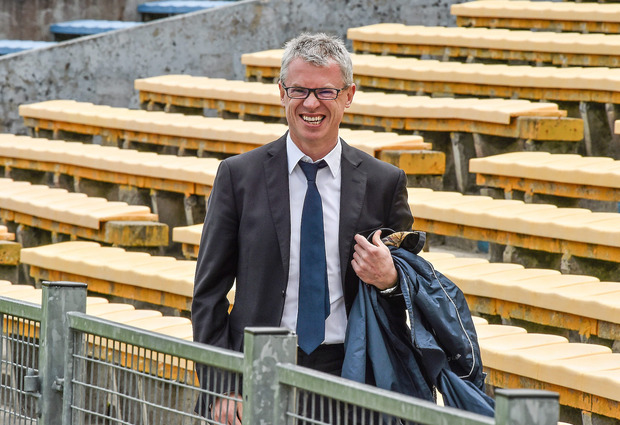 Joe Brolly has hit out at the defensive approach taken by many counties and says that it is having a negative impact on grassroots football. Brolly posted a video on social media last week of a passage of play from a game between St Patrick's Maghera and Abbey CBS in the Brock Cup, with the former playing the ball amongst themselves outside the 45 while the latter had all 15 players camped inside their own territory. The farcial scenario contributed to a low-scoring 0-2 to 0-1 win in favour of St Pat's, with Brolly saying that Abbey CBS were 'desecrating' Gaelic football with their approach. Speaking on The Throw-In, Independent.ie's GAA podcast, Brolly said that a number of parents had contacted him about a match that he brands a 'scandal'. "The Abbey CBS were one of the glories of Gaelic football and produced some of the best Down players ever to take the field," he says. "They had supreme style. I got three, four, five texts from St Pat's parents. Three or four of my Derry team-mates had sons playing. They texted me saying, 'you've got to see what is going on here'. This is the Brock Cup U15, the jewell in the crown of U15 football. "In the previous two games St Pat's scored 2-16 and 4-16 and they are a lovely attacking team. Here they are against the Abbey, and the Abbey go all 15 players inside their 45 and they stayed there. What could St Pat's do? They were entirely confused. It was 0-2 to 0-0 at half time to St Pat's. Abbey got their first point with a few minutes to go to make it 0-2 to 0-1. "It's a scandal. Parents are disgusted. The video that was sent to me was six minutes long, I had to cut it to two minutes so it could be posted on Twitter." Brolly adds that in his view, the reason viewing figures were down on RTÉ for last year's All-Ireland series is down to a number of teams playing defensive styles, which are now being copied by underage coaches. "It is no coincidence that the viewing figures are down," Brolly said. "People are saying, I can't watch Galway, I can't watch Fermanagh. Every time Galway win a game, it is a dagger in the heart of Gaelic football, and every time Fermanagh win a game, because then there's another coach out there who says, 'let's do this'."